Treatment with braces by Dr. John Walker of Walker Orthodontics is no longer associated with bulky metal bands on the teeth and awkward teenage smiles. Ceramic braces are a discreet and effective method of orthodontic treatment in Groton, MA for those patients who want to straighten their smile without attracting a lot of attention while wearing braces. Ceramic braces are clear (or tooth-colored) and comfortable, and they still align your teeth effectively and give you the smile you have always wanted. Ceramic braces, also sometimes referred to as clear braces, are braces that are made of a clear or tooth-colored ceramic material. 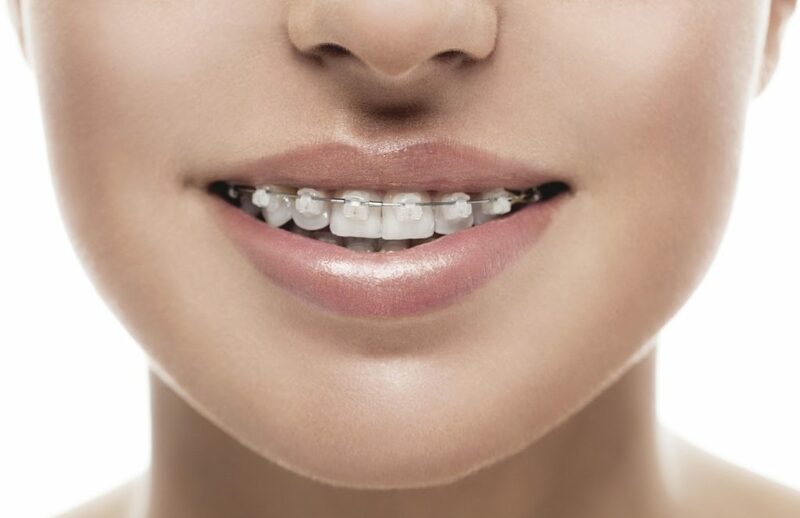 Dr. Walker attaches these braces to the front of the teeth in the same way as traditional metal braces; each bracket is connected to a tooth and connected to the other brackets by a wire that is gradually adjusted to achieve the desired result. Because of their material composition, ceramic braces are more fragile and they require a bit more care than traditional metal braces. Ceramic braces are permanent in your mouth for the length of your treatment. What are the advantages of ceramic braces? Ceramic braces offer many advantages over other orthodontic treatment systems. They provide a virtually invisible way to correct all kinds of orthodontic issues such as overbites and/or crooked teeth. And because they are made of ceramic and not metal, there is less chance of irritation in the mouth from the appliances. Ceramic braces are more effective also at treating more severe orthodontic issues than Invisalign clear aligners. Invisalign aligners are removable plastic trays that can be lost or carelessly applied. Ceramic braces are permanent and cannot be lost. How much do ceramic braces cost? Orthodontic treatment with ceramic braces in Groton, MA can vary in price, but they often cost around the same as treatment with traditional metal braces. Dr. Walker works with each patient individually to create a customized treatment plan that will work with each patient’s schedule, budget, and treatment goals. If cost is an issue, Dr. Walker and the team at Walker Orthodontics can work out an individualized payment plan appropriate for the patient’s treatment. Walker Orthodontics also accepts a number of insurance plans that may help lessen the cost of treatment.